We are approved to satisfy your CE requirements with the MS State Board of Contractors. Complete your continuing education to renew your Mississippi contractor license today. All of our courses can be completed At Your Pace Online to help you meet the state's requirements to maintain your license. Once you finish your course, you'll receive an official certificate of completion to save for your records. 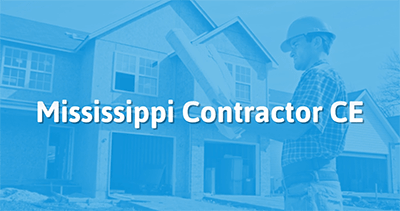 Mississippi residential contractors must complete 2 contact hours of continuing education before license renewal. This course, Mississippi Roofing & Maintenance, has been approved by the Mississippi State Board of Contractors for 2 hours of continuing education credit. This 2 hour continuing education course, Mississippi Digital Marketing, has been approved by the Mississippi State Board of Contractors. This course, Mississippi Project Management, has been approved by the Mississippi State Board of Contractors for 2 hours of continuing education credit. Mississippi Brick & Block Masonry, a 2 hour continuing education course, has been approved by the Mississippi State Board of Contractors. This course has been approved by the Mississippi State Board of Contractors as providing 2 hours of continuing education credit to contractors in the state. Congratulations! Mike Melvin's application to be listed as a continuing education instructor has been approved by the Mississippi State Board of Contractors. The following courses have been approved by the Mississippi State Board of Contractors for continuing education. Please visit our website at www.msboc.us for a complete list of continuing education providers, instructors, and courses. If you have any questions or need additional information, please feel free to contact me at the telephone number and/or address listed below.